Sometimes the nicest thing about living with companion animals is watching them relate to their own companions, i.e. other dogs, cats, guinea pigs or birds in the house. Heard of Harlow and Sage? Until Sage, a dachshund, passed away, she and Harlow (a Weimeraner) were best friends. Their bond, despite their significant size differential, was documented by their owners on Instagram and – like a good cat meme – went viral. A publishing agent got in touch and plans for a book about their bond were underway. 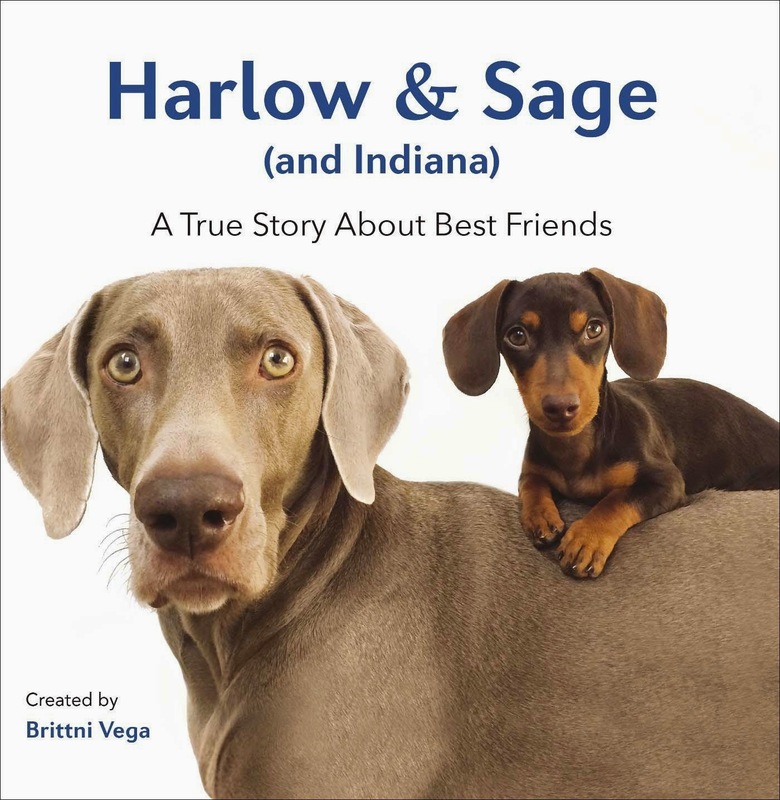 When Sage passed away, it wasn’t long before Indiana arrived – Harlow & Sage (& Indiana) was born. SAT had the chance to chat with creator Brittni Vega about her canine companions and the bond between them. I work at a financial institution. Taking pictures of my pups has always just been a fun hobby. It has turned in to much more over the last few months though. How did Harlow & Sage come into your life? My family adopted Sage when I was thirteen. My mom grew up with Dachshunds and thought that one would make a great companion for me. She was right! Sage was my best friend growing up. Harlow came along eight years later after my husband and I got married. We both loved Weimaraners and couldn't say no when we saw that a little Weimaraner puppy who was living on a farm needed a home. We were contacted last January by a publishing agent in New York who had fallen in love with our story. The two of us worked together on a proposal for a book and a few months later, it was published. The idea for Harlow narrate and tell the story in her own words made the most sense to me as Harlow was the link between Sage and Indiana. You lost little Sage last year. How did you cope and how did Harlow cope? It was very difficult but we knew that it was coming. Sage had been having health problems for long time. Harlow probably took it the hardest. She had never been without Sage and so the first few days without Sage were very hard. Harlow would wait by the front door for Sage to come home or look out the window for her. When we brought Indiana home shortly after, Harlow seemed confused because she had never been around a puppy but the two of them connected quickly. They are inseparable now. [Indiana’s arrival made world headlines – see for example here]. What's it like having a puppy again when you've been living with grown up dogs for a while? A lot of work! But very rewarding. Indiana brings so much energy to our home. She keeps all of us very busy! You captured Harlow, Sage and Indiana beautifully. Any tips for photographing pets? Always have your camera close by. My favourite pictures of my dogs are the most candid ones. Treats and squeaky toys are also great to have around too! Obviously Harlow & Sage had an incredible bond, as do Harlow & Indiana, but how would you describe your bond with these animals? They are the most important part of our lives. My husband and I revolve everything that we do around them. They make us happy every single day, we try very hard to return the favour. They get lots of love and attention. Finally do you have any tips for veterinarians and vet students? No tips, just a huge thank you for all that they do. Thank you Brittni. You can check out Harlow and Indiana on the Harlow & Sage facebook page here or buy the book from Penguin Australia.